Lyle: In the last lesson you worked on basic strum patterns using quarter and eighth note patterns. Here are a few more patterns, this time using 16th note rhythms. Take a look at a ruler, it has inches divided up into quarters, eighths and 16ths. Lyle: Think of an inch as 1 measure or 1 bar, same thing. In that inch, think of each quarter inch as a beat in the measure, so there are 4 beats in the measure. For most of the patterns you'll use in this lesson you'll be dividing up each quarter inch or each beat 4 times for a total of 16 little beats inside that inch or measure. Lyle: The way to count each 16th note is: 1-e-&-a-2-e-&-a- this is 2 beats worth of counting. Count out loud and tap your foot down on just the numbers. Lyle: Here's strum pattern 1. It uses every 16th note in the measure. 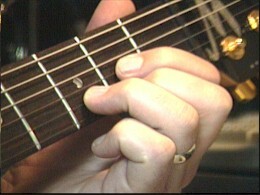 You'll be using alternate strumming starting with a down strum followed by an up strum. Continue strumming down, up, down up for the whole pattern. 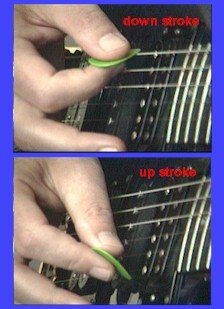 Angle you pick down for the down strum, up for the up strum. Lyle: Let's use a C chord for this example. Lyle: Add this simple Fmaj7 chord so you can make a 2 chord progression with these strum patterns. Lyle: Jam along to this looping sound clip. It is 2 measures long starting with C for one measure then Fmaj7 for one measure. Lyle: Next pattern breaks up the continuous pattern from above. Look closely and you'll see the difference. Lyle: Notice that there are "holes" in the rhythm compared to pattern 1? This helps give the rhythm a bouncy feel, or more accent. Lyle: Use this jam track to practice pattern 2. Lyle: The next pattern is a bit tougher, but it sounds the best. Lyle: Notice where the down and up strokes are landing. Lyle: Here's a jam track for this pattern again using the C and Fmaj7 chords. Lyle: The next pattern uses just the "up beats" or just the eighths of each beat. 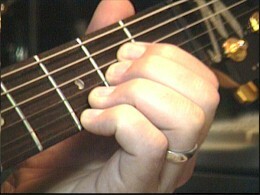 You can strum this pattern with all down or up strokes. I like all down at this slower tempo. 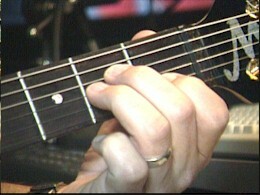 Lyle: Also, you'll palm mute the strings after each strum. The video clip should help you see this. 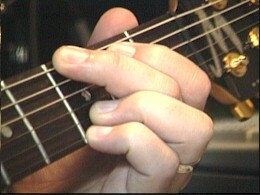 Lyle: Jam along to this looping clip for strum pattern 4. Lyle: And here's an open G chord. Notice the use of all 4 fingers with this version. Lyle: C - Fmaj7 - Am - G - one measure each. Lyle: Here's a sample of me playing this pattern. 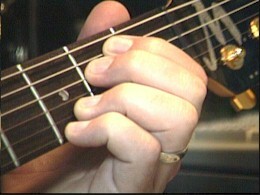 Lyle: Try strum pattern 2 with this chord progression. Lyle: Try strum pattern 3, my favorite. Lyle: If you want to try improvising over this jam track, use the C major and C major blues scales. Lyle: Here's a new chord progression in the key of G.
Lyle: Each chord gets 1 measure making up a 4 measure progression, like you did earlier. Practice the strum patterns from above to this new chord progression. Here's a few samples of me playing this new chord progression with each of the 4 patterns. mao: Is there songs that use these progressions? Lyle: mao - yes, these are basic chord progression and strumming patterns, used all the time. mao: Like the cranberries or something? Lyle: Yes, and U2 and lots of country songs use rhythm patterns and progressions like these. Lyle: At the very beginning of the lesson, I posted an intro sample.mp3. It used these chords and scales. Lyle: Practice counting out loud and tapping your foot to the beat.